NEW YORK CITY — These real estate agents are no Grinches, but they do want to strip your home of every ounce of tinsel, oversized Christmas trees, and reindeer sleighs in the windows. If you're trying to sell your home during the holiday season, unpacking that big bin of holiday decorations could prove to be a big lump of coal for house hunters, experts warned. 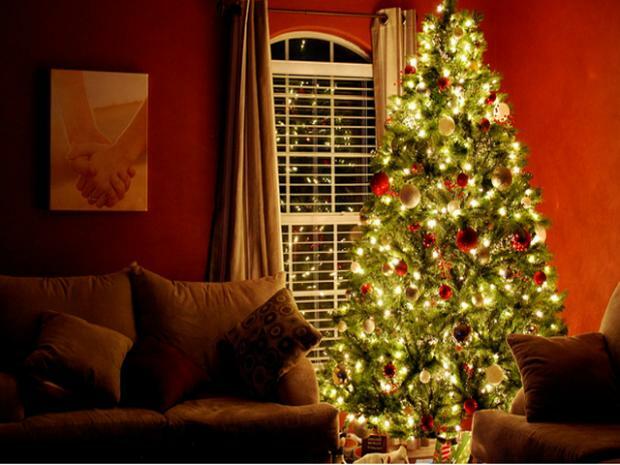 "Try not to get a huge, huge Christmas tree," said Jennifer Lee, of Charles Rutenberg Realty, who said an oversized tree only works to make your apartment look smaller. Instead, look for a tree that's smaller, to make the living space seem bigger, she said. Sleighs in the window? Also a no-go. "It's cute in a way, but I think it distracts from the light and obscures the view," Lee said, adding that the decoration also blocks light. Though holiday decor is not inherently a turn-off to potential buyers, these items in excess can mask an apartment's amenities — or risk being perceived as in poor taste — around the holidays and any time of the year, experts said. Lee suggested that a good rule of thumb is that "less is more" when it comes to seasonal decorating. "The focus should always be on the home," she said. "You want to accent the assets of the property. It's hard to bring a buyer back, and if they were serious buyers, I'd want them to see this place in its top form." Lee also warned that it's not just Christmas and Hanukkah that pose a risk. She once refused to show an apartment before Halloween until the sellers removed the fake cobwebs, rats and roaches they had scattered around the place. Prudential Douglas Elliman's Jacky Teplitzky echoed the sentiment, saying that people "have an attention span of two minutes." "You have to be conscientious that you are selling your apartment. You ask, 'What did you think about the apartment' and they say, 'What apartment?'" she said. Teplitzky also said that sellers should avoid overtly religious displays. "New York is known for having a diverse population, but you have to be careful for one religion or another," she said. "Then people don’t focus on the apartment — they focus on the [religious] theme." One house hunter, a 61-year-old marketing executive who asked to remain anonymous, said he agreed with the advice, even if it seems like it's putting the kibosh on holiday festivity. The man said if he walked into an apartment with a large, religious Christmas display, he'd be alarmed — even though he would do his best to imagine the home without it. "I'm Jewish," he said, "so I'd feel like I'm in a foreign country." Doug Perlson, co-founder and CEO of online real estate firm RealDirect.com, said the holidays can still provide a good excuse to glam up your house. If you want a festive look, opt for gold and silver ornaments, as they tend to be more visually appealing during viewings. Sellers should avoid covering their doors in wrapping paper at all costs, he said, as home entries are the first things buyers see. "If you would like to decorate your door, stick to a neutral wreath," he said. So how can a seller safely get into the holiday spirit? Perlson had one suggestion — baking cookies. "That's actually something that you can do during the holidays," he said. "Having the smell of a fresh cut tree or fresh baked cookies certainly can't hurt, and I think the impact is that much better during the holiday season."